In this weeks episode we are in a little bit of a “lull” period with March Break so there is not a lot of new condo projects to talk about but we do a deep dive into the best new condo launches that are just around the corner including Sugar Wharf, Garden District, M2M and much more. Just a reminder that you can now listen on the go with the TalkCondo Release Radar Podcast. Subscribe anywhere you listen to podcasts and get notified of all the best new condo launches as soon as we get them. 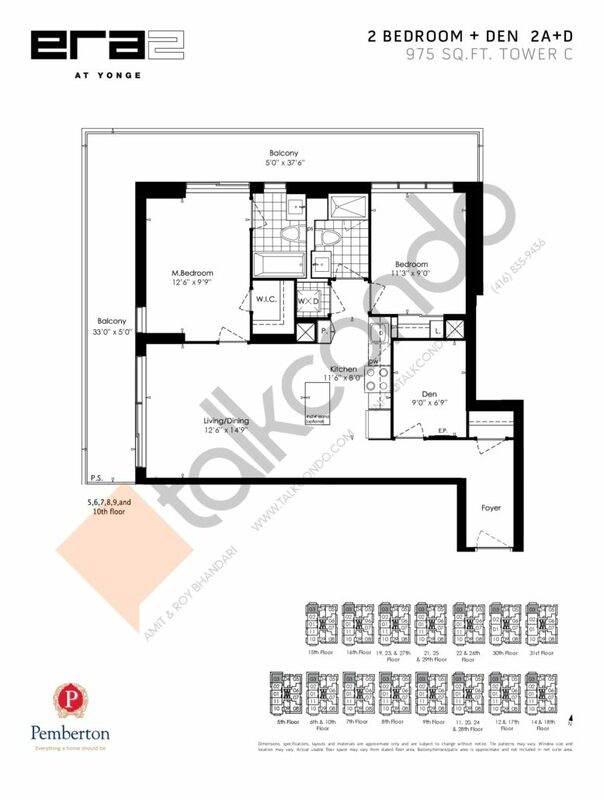 Roy Bhandari: Welcome to the TalkCondo Release Radar where every week we talk about the latest new condo launches that you can buy today and the best ones that are coming soon. So, this week is a little bit interesting because we’re in a bit of a lull week. 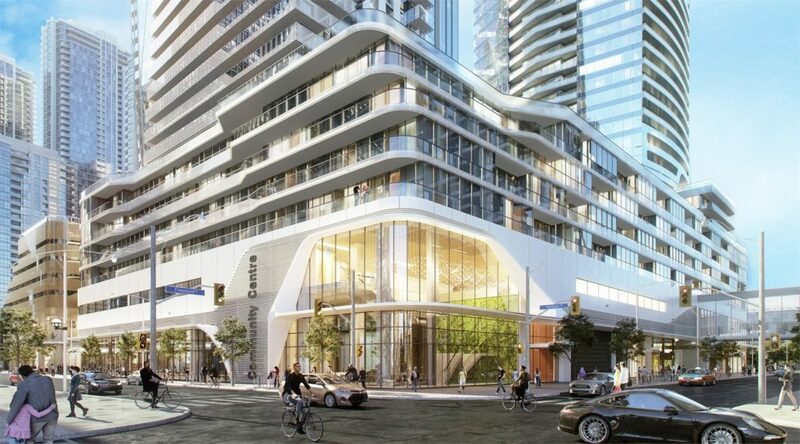 It’s March break, a lot of new condo developments don’t launch a lot of new condos. 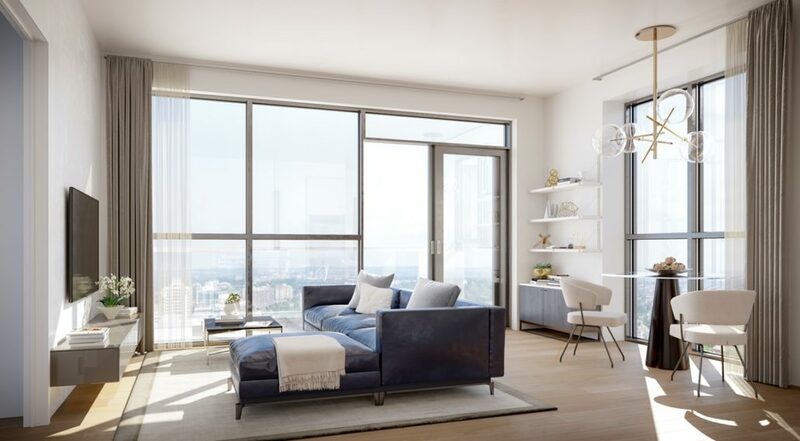 Last week, we talked about six or seven new condo launches, but out of those six or seven, three of them are essentially not sold out, 100% sold out, but we’re dealing with very limited inventory. 1181 Queen West, we talked about last week as a great option, sold out. Auberge On The Park Phase II by Tridel. We’re dealing with only larger units around, $800,000 at this point. 859 West, again, very limited inventory and that just shows how quickly these great projects launch and sell out. So what we’re going to do this week is we’re going to talk briefly about a couple of projects that you can buy today but really dive into what’s coming up because there’s some great projects in the pipeline. So, the first one is one we touched on last week but, again, they saw some great units and we really want to talk about the One Yonge. So give us a brief breakdown on One Yonge. Amit Bhandari: Yeah. So, we spoked quite a bit last week. 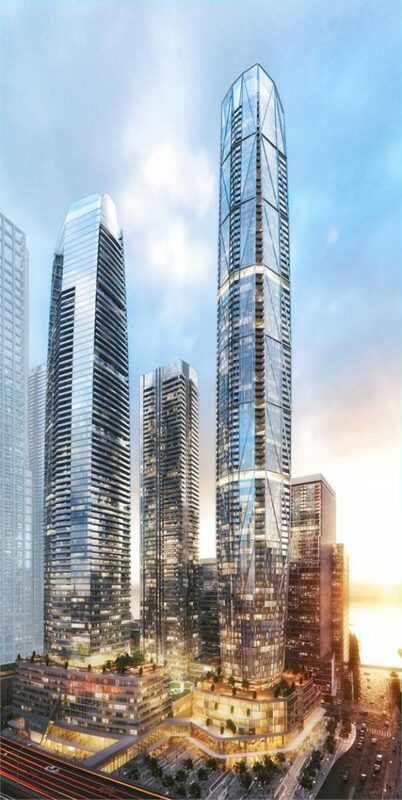 So, One Yonge, the initial phase is going to be 65 storeys. It’s called the Prestige. We touched on what things are a part of the entire development. You know there’s the 50,000 square-foot community centre, 100,000 square foot a total amenity space. The path connection it’s well and truly a multi-faceted overall development. There is actually one particular floor plan that i wanted to highlight and it’s east facing. Now, the reason why I really like this unit and we’ll talk about this a little bit later because of the potential views here. So, just to give you some bearings is literally to the east of One Yonge, the entire development will be Sugar Wharf. Now, part of that development, this is going to be a two-acre park. So the east facing units do have potential to overlook this beautiful landscape park as well as the East Bayfront, going towards East and potentially, potentially some partial lake views as well. Roy Bhandari: Well, if you think about the way the lake wraps around it, it actually does wrap up. So, again, when you talk about partial lake views, I think you’d be surprised at how much of the lake you’d see from this pattern. Amit Bhandari: See, the amazing thing is is even if you … a lot of people are so focused on the lake. I personally love city views. Mike Santos: Yeah, that’s a personal preferences. Amit Bhandari: As that East Bayfront gets built out, I think is going to look incredible. You have all the new development going upon there. 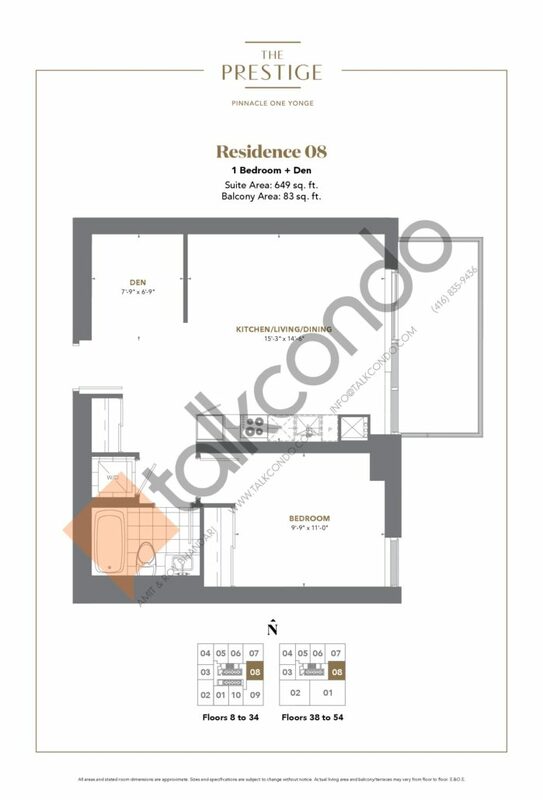 The one particular unit that I really like is actually called the Residence 08 Floor Plan. It’s a one plus den. It’s 649 square feet. It’s east facing, so it is overlooking Sugar Wharf and further down towards East Bayfront along Queens Quay. The reason why I really like this, the specific unit itself, it’s sort of separated its living space with sleeping space, I guess. It’s all on one side of the unit, beautiful balcony as well. So, you’re going to have that very expensive, very beautiful for you. 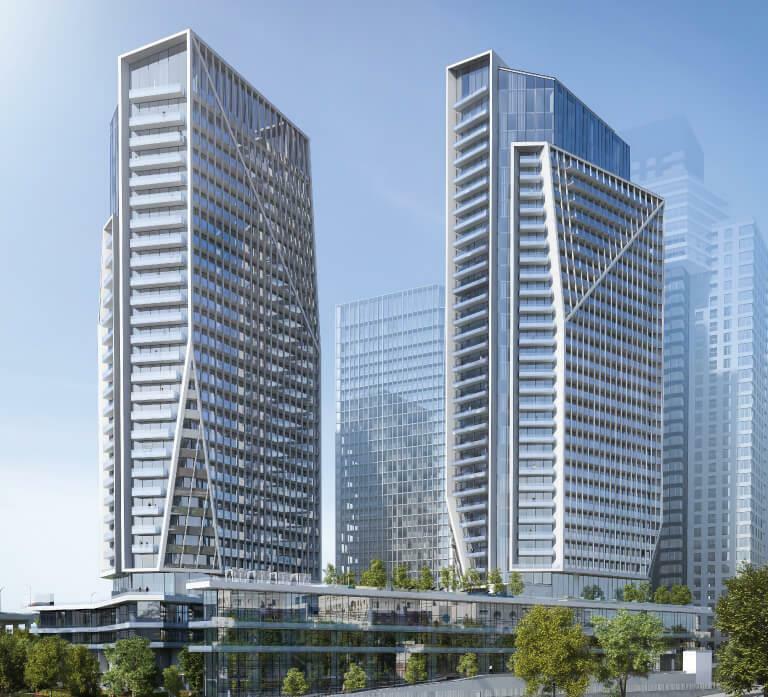 The building itself, like I said last time, is going to be 64, 65 storeys, 500 suites. The expected completion is 2022. There’s some really good units still available. Other than this particular one, I encourage folks to take another look at it. Fantastic development and you can still get great units at platinum pricing, so. Roy Bhandari: Day one pricing. Amit Bhandari: Day one pricing, so. Mike Santos: Yeah. This is another one we talked about last week, just to refresh people’s minds. It’s Highway 7 and Yonge. Pemberton builds master-planned community and this is the last tower that’s available. The project has been selling for a little bit, but prices are still really good. There’s some inventory left and I know people always talk about one-bedroom plus den, one beds. Investors are always sort of driven to that kind of product, but sometimes at projects there are other types of opportunities. And so, one thing I wanted to bring up was some of the larger units at this project because the price per square foot is actually really, really good. At this one, we’re looking at one particular plan, the 2A+D Floor Plan is on the northwest corner of the building. It’s $625 a square foot with parking and locker, which is something that you are not seeing. Amit Bhandari: I don’t think you are, really. Mike Santos: No, you’re really not seeing that in this market. 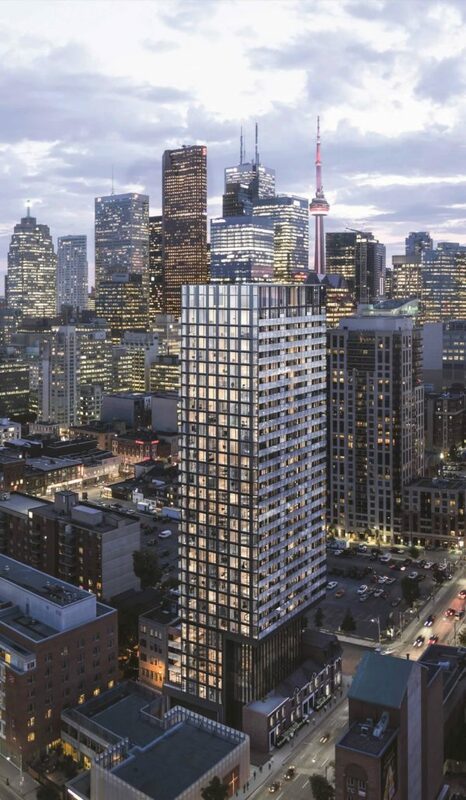 So, people will say, “Why are these sort of units sort of undervalued?” Well, we’re talking about views at One Yonge and sometimes views can be overstated a lot of the times. I mean, this is a Richmond Hill project. I mean, it is a great, beautiful area but you’re not looking at lake views, you’re not looking at downtown city views. So, are you going to pay that $100 extra per square foot and maybe have a slightly better view, or are you going to get the better floor plan for $100 a square foot less? Because in five to 10 years, when people are looking for functional space as units in the city gets smaller and smaller, they’re going to be looking at these types of units. So, this particular unit here, you go any of a very short foyer, so it’s the 2A plus D. Right now, the latest price that we have on starts at $612,000. So, the foyer, you go in really short which we like. We don’t really like to see super long foyers which is taking up so much square footage, big, nice, open concept kitchen with tons of island space, living and dining, to wrap it like a huge wraparound balcony, nice master-sized bedroom with a walk-in closet, ensuite big second bedroom, and that den, nine by seven, potential a kid’s room. There’s definitely potential there for a kid’s room. We could even turn that into a third bedroom. So, huge potential, 625 per square foot. This is still available. Roy Bhandari: Yeah. So what I like … one of the thing that I want to touch on here is that its market specific, right? 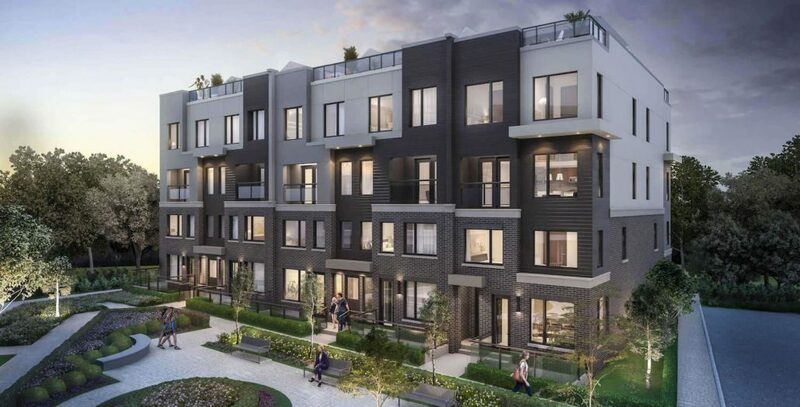 In Richmond Hill, the market like that, you don’t necessarily want the smallest units where there’s a lot of move-down buyers who are going to look for something more like this more space to move down into. There’s a lot more buyer potential. Roy Bhandari: Which [inaudible 00:06:54] really so that’s a really major one. Mike Santos: Yeah, for sure, and we kind of take that for granted when we talk about this project, but for people that are watching, 40 minutes to downtown, you’re not paying downtown prices, gives you a little bit more space and even from an investor angle at 620 … at 600 and … let’s call it a little 600 price can buy you a lot more square footage [inaudible 00:07:16] but show which end of futures may be huge. So, a lot of people will take another look at Era 2 especially the larger units because there are some really, really good deals still there. So, I do my advice [inaudible 00:07:25]. Roy Bhandari: Good. And now we’re going to have a peek at Lumina condominiums. Lumina is the ninth tower at the Emerald City redevelopment [inaudible 00:07:34] very more. I know you’ve got another look at the floor plans there and you’ve picked out one that you really like as well. Amit Bhandari: Yeah. So, I just want to go briefly explain how Emerald City was built. It was basically in three lots basically, and it went 3-3, and now the final lot. This is the third tower, final tower the ninth tower. What makes this one interesting is, is that it runs along. So it’s sort of a long building and it’s running along Don Mills. I really like that because that entire west view, it’s all low-rise. So I had a brief look yesterday. Henry Farm the neighborhood name and just to get an idea and just to get a sense of the kind of real estate that is in that neighborhood, it is currently a listing for 1.5 million in that neighborhood. So it just shows the kind of neighborhood that Emerald City is in. 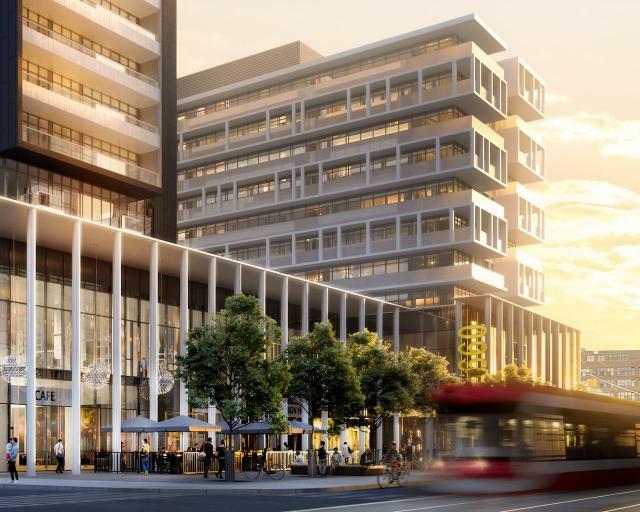 Obviously, the other benefits of this development and I touched on this last time was walking distance to the Don Mills Subway Station, walking distance to Fairview, lots of retail. There’s also parks, beautiful park, green space. The particular plan that I really like and there’s a reason why I wanted to talk about those west views, it’s called the Swan model. Now, this is a one plus flex. Now, I remember you talked one plus flex last week. What makes this one plus flex interesting is, is that it actually has two washrooms, this particular unit. Roy Bhandari: Yeah and that’s a huge bonus. Amit Bhandari: So the flex room, I mean, yeah, it’s one plus flex to explain it. The reason it’s called the flex is because it could be used for den, or playroom, or potentially a second bedroom. The fact that this has a second bathroom, it could be … it’s a two plus … two bedroom, two washroom unit. Roy Bhandari: It’s going to rent like a two [bedroom]. Amit Bhandari: Exactly. This, in terms of availability, you could pick one of these up for 484,000… 493,900. Roy Bhandari: Below the $500,000 mark, is it a tough price point right now, super tough. Mike Santos: We pushed that a lot for sure like this type of floor plan that it is like we got to look beyond the square footage. I’m still going to look at the practicality of it, right, the efficiency of it. Amit Bhandari: And the cherry on top means you’re going to get the worst views. So you’re overlooking one point something of a million dollar properties that are likely not going anywhere. So you’ve got pretty much protective views, west views. Roy Bhandari: Next we’re going to talk about the new condos that are coming soon and we always emphasize the importance of getting it first, getting the platinum and the day one pricing. So it’s really important to build up to these and know what’s in the pipeline. So, the first one is one that is a new condo project, that is in Mississauga. We’ve got some more details now. We’ve got a launch date. So, Mike, why don’t you talk to us about The Way Urban Towns? Mike Santos: For sure. And just to get back to what you’re saying, in terms of the coming soon, it’s like we’re putting this out there for people to know what’s coming up and getting contact with this as well. If you’ve registered for any of these projects, getting contact with us, ask us, give … what keep you as post as we possibly can as info comes, but it’s best to stay in contact with us as much as you possibly can, and then we can give you updates so you’re ready for those launch days because sometimes people go on vacation or they’re kind of just not thinking about it for a second and it comes up and they’re not prepared. Roy Bhandari: Well, we said … at the top of the episode, we said, just in the last week, the three projects that we talked about a week ago, it’s very tough to get units in them. Amit Bhandari: The absorption is crazy. It’s really strong. Mike Santos: So just a quick note in terms of timing because it’s really, really important before we jump too much into it, but in terms of The Way Urban Towns where I was talking about it’s in Mississauga. A lot of people are looking for stuff that’s … it’s been mostly building square one right now and a lot of people just don’t want to be in the square one. They don’t want the busyness of it. This is a little bit different of a project. It’s called an Urban Town which for people that don’t really know. That means it’s a stacked townhouse. When a stacked townhouses, again, something that might need to be explained, generally speaking, there’s three units within one building. You’ll usually have a main floor, a second floor, and then the unit above that will have two floors plus over the top terrace. And so, a lot of projects going this way. We’ve done a few like that. The price points are super, super nice for people here. You’re looking at 520 a square foot for this project. Roy Bhandari: [inaudible 00:12:16] incredible. Mike Santos: Yeah, really good, and units as well. So, you’re not looking at squeezing into 700 square feet for your family. So two and three bedroom makes 144 units, or yeah in total, and that again in terms of location, this is not in square one, this is in the Erin Mills neighborhood. For anybody who’s looking for something a little bit quieter neighborhood, that Erin Mills in college way, you’ll be close to the QEW, close to the 403 Erin Mills Town Center, University of Toronto, Mississauga campus. So you have opportunities as an investor if you want to. Amit Bhandari: Credit Valley Hospital. Mike Santos: Credit Valley Hospital, super nice community. Really, really great pricing and in terms of the finishes, really nice, much better than you see a lot of kind of projects like this to be completely honest. The renderings were really, really nice and the group that’s doing this sort of our group, really nice stuff coming out. So I’m excited. It’s coming out, I believe, a couple of year. Roy Bhandari: Yes, so we got an early broker launch with some information coming up in the next couple of days, And we should have information on this in the next week. So stay tuned on this one for sure. 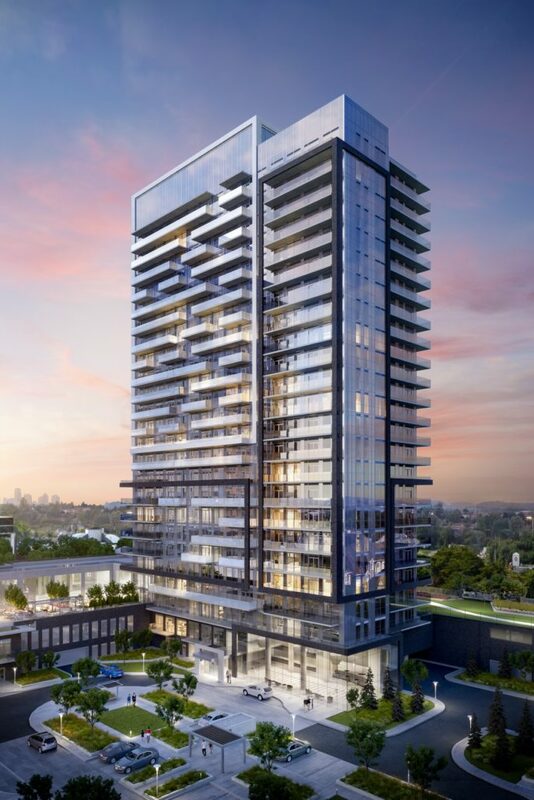 If you’re looking for a Mississauga project, this the neighborhood that we know really well. Roy Bhandari: We spent 10 years in that neighborhood, but when we’re growing up and it’s an area that’s crying out this kind of development. There’s a lot of large houses, this modern urban sort townhouses. This area is really crying out. I think these ones are going to get picked up really well. Mike Santos: For sure, yeah, definitely. Amit Bhandari: I hope I’m saying right. Roy Bhandari: You are. They drilled that one into us. 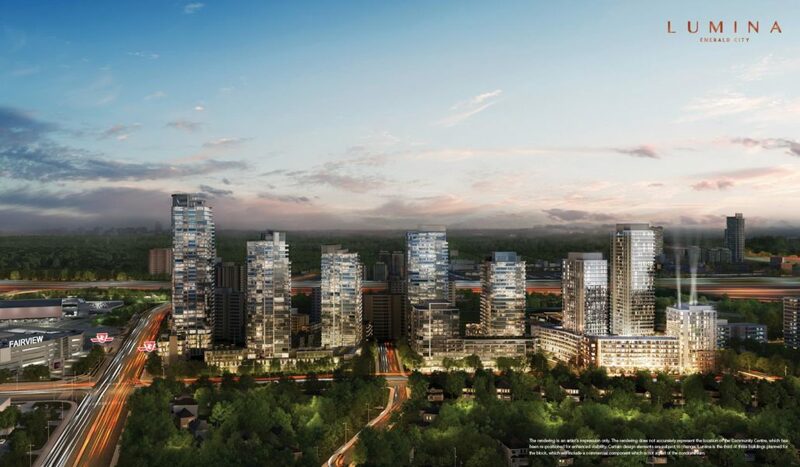 Roy Bhandari: Aoyuan, this project is called M2M Condominiums. 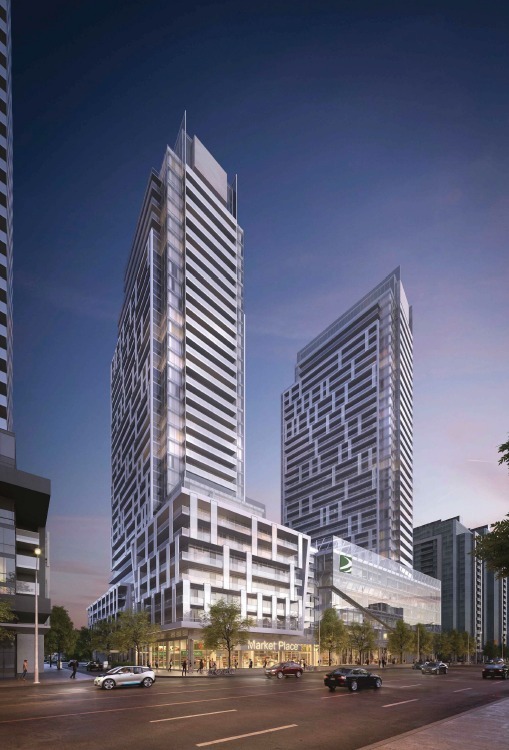 This is a multi-phase development at Yonge and Finch subway. This is a major, major development. This one, this site used to be the Newtonbrook Plaza, a group called Aoyuan Developments from China, Chinese developer with international exposure in Sydney. They’ve done development in Vancouver and Sydney. So there were a major, major development. They came in and they picked up this parts of land for over $250 million. This is a major, major instrument, huge project. Anybody who’s in the area is aware that the Newtonbrook Plaza has been … going to be developed. Amit Bhandari: Very old as well, lots of people in here are very familiar with the Newtonbrook Plaza. Yeah, no, the scientists … it’s very, very exciting. This is a running theme from last week, multi-phased again. 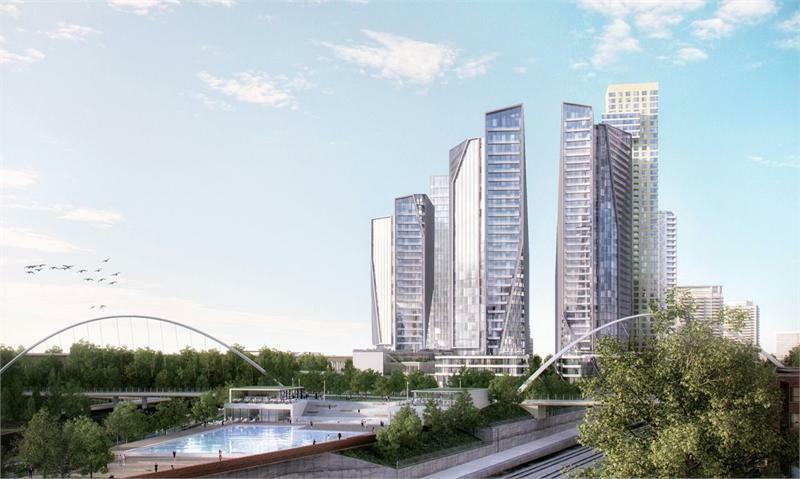 So this one is proposed to have a total of 1,600 units and that’s stretched over five residential towers. So, a little bit about Aoyuan. You touched on a lot of things there. They’re very, very prominent in the Hong Kong market and they’ve done seven, I believe, seven towers or seven developments in Australia. 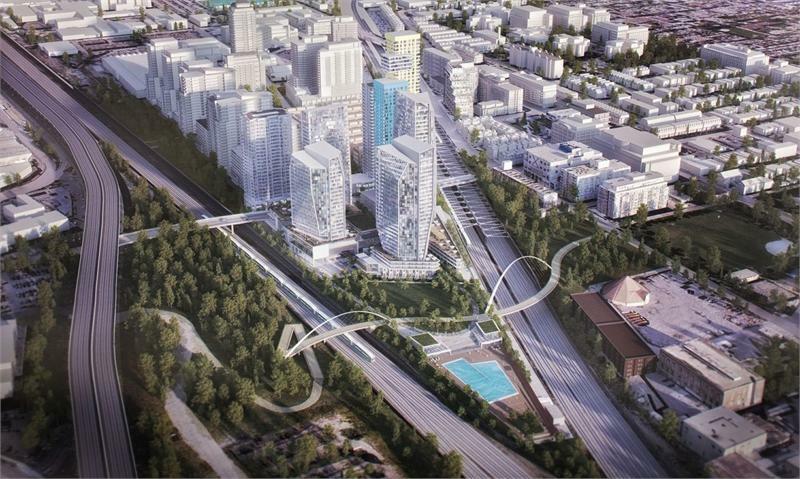 They’ve also got a couple developments in Vancouver as well. So, the footprint of the Newtonbrook Plaza is huge. Like if you look at it on, say, Google Maps, it’s very, very prominent. And just to give an idea on bearings, the exact site is on the south east corner of Yonge and Cummer. I checked on Google Maps as well. This is roughly seven-minute walk to the Finch subway stations walking south. So this is north of the Yonge and finch, seven-minute walk to the Finch subway station. It’s going to have retail on the base, it’s going to be multifaceted, lots of elements to it, five towers and 1,600 units, very, very exciting. Roy Bhandari: One of the things I do want to touch on, I …. we had a chance to have a lunch with the developers. Amit Bhandari: Yeah, couple weeks ago. Couple of weeks ago. Amit Bhandari: Their own team. Roy Bhandari: … their own team. Amit Bhandari: The ones that are unfamiliar with the trends of market, local markets. Roy Bhandari: What they’ve realized is that Toronto is a hyperlocal and they’ve bought the best of the best from other developers and it’s really good. The architects are local. They know exactly what this area is looking for and they’ve done a really good job of doing that. Mike Santos: If you’re going to spend $250 million, you better do it right. Mike Santos: Yeah, right. Yeah, for sure. That’s great. 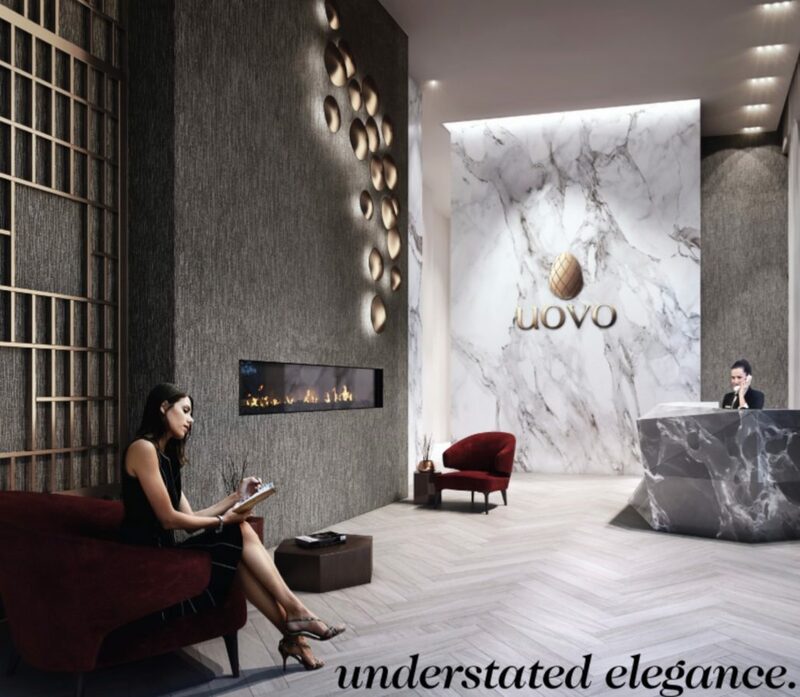 Roy Bhandari: Another one we want to touch on because we’ve got a lot of new information in the last couple of days is UOVO condominiums. Roy Bhandari: At Yonge and Davisville. Amit Bhandari: Yeah. I actually found out the meaning of it. It means egg and it’s actually the logo. So, if you see the marketing material we sent out, it says it’s that. Again, my neck of the woods, just north of here actually, just at Hillsdale Avenue West and Yonge, the southwest corner. The new information that we received was … is the old stuff that we already knew was 11 storeys, 67 boutique unit. Sorry, 67 open concept units. The square footage range is 630 square foot to 2,000. So you’re looking at the small one bed all the way to 3-plus debts. I’m always excited to see boutique buildings but you don’t really see them too often. It’s getting harder and harder. Yeah, they’re getting very, very tough. I think the way that they’re designed the building and I think the fact that it is a boutique building suits this neighborhood [inaudible 00:17:43] because especially along this stretch up in Davisville, along Yonge Street. I think it’s a very, very cool concept. Whoever’s very interested in boutique buildings, I urge them to take a closer with this one. The name of this is fantastic, has great schools, amazing parks, fantastic retail, I mentioned this last week. You are a five-minute walk from event, the event of LLT and the Eglinton Subway Station. Mike Santos: Lots of calls about this one, too. We’ve gone the area especially like if you’re looking for that downsizing kind of project while keeping that boutique or keeping that luxury kind of feel, you become accustomed to, like you want to … they’re not lying and seriously want to be on top of this one for sure. Amit Bhandari: Yeah and that’s a key point because Yonge and Eglinton, like I said, it’s only five-minute walk. The exhaustion has been extremely strong. Roy Bhandari: We spent a lot of time in it. It’s not too far from Art Shoppe condominiums. Roy Bhandari: One of the things that we really touched on and it’s similar to Lumina here, but if you’re looking to buy a low-rise in the area, it’s … the prices are sky high even the multi-million dollars. So, this is an option for someone who’s looking for a larger space. I can’t quite get into that residential market and these are the kind of buildings that really speak to that. We got some information on suite finishes. Amit Bhandari: Yeah. I was just going to talk about that, too. So, the price range is going to be from the mid-600s all the way to two million. So you’re all looking at a very much higher caliber, very high-end building, the kinds of finishes. You’ve got nine-foot and 10-foot high, smooth ceilings. You’ve got gas inside and out. Roy Bhandari: That’s awesome [inaudible 00:19:17]. Roy Bhandari: So, 13-foot kitchen run which, again, if for those who are not too familiar, standard kitchen of modern condominium is anywhere from 8 to 10 feet. So you are getting that oversized kitchen. Mike Santos: The stuff [inaudible 00:19:37]. Amit Bhandari: No, absolutely. It’s very, very exciting. I’m really looking forward to that. I think it’s a welcome addition to the neighborhood. We’re expecting completion to be between 2021 and 2022. Amit Bhandari: Was it April? Roy Bhandari: Yeah, some time in April. Even next month also we’re really going to get a lot of information. Amit Bhandari: Yeah. Well, we should start getting some more information. We did send out some information especially on this update about a week ago, but hopefully we’d get some sort of launch of timelines very, very soon and, of course, we will send that information. Roy Bhandari: So the next few projects are ones that we did do a bit of a deeper dive on last week. We’ll touch on them again because they are great projects that are in the pipeline, but we’ll run through the next few very, very quickly. So the first one is Garden District Condos, Mutual and Shuter Street, Downtown Toronto. Just give us a quick rundown. Mike Santos: No, there’s not a lot of [inaudible 00:20:35] episode last week and for anybody who’s watching. We’ll definitely delve into this once these are ready to launch. We’re going to delve absolutely deeper, a lot more detail, but this is just giving you an idea of what’s coming up in an area if you’re looking for more core projects, you’re within five minutes of Dundas Square, Eaton Center, Queens Station, Ryerson, major hospitals, retail. Like you can’t get more core than this right now. So, this is something. The cool thing is that they are going to be incorporating some heritage townhomes at the base of the building. So, a really cool project that’s going to keep a little bit of the prestige and sort of life from that particular neighborhood. But we’re going to have way more details. We’ll delve into it a lot more, but with a AAA location. So, this is one to keep it a notch. Roy Bhandari: You mentioned heritage homes, the site is actually three homes that were bought out. They’re going to be cooperating into the base. The next one is the [inaudible 00:21:36] development sugar wharf. I’m going to Put a lid on this because I know you can talk forever. So give us the quick rundown and then we’ll do it, big, big dive with [inaudible 00:21:47]. Amit Bhandari: I’ll be very quick I promise. Something that I should have mentioned last time with John Tory. It was a big positive groundbreaking ceremonies, right? Big deal and, obviously, a lot of people heard is speech. There was a couple of key takeaways that I had … like I said, I really wish I mentioned last time. But for me, key takeaways and it’s all related to not only this development but everything else is going on in Toronto is the municipal, the city as a whole, they have lofty ambitions to be the greenest city in North America. Now, obviously, there’s a lot of things that they need to do to be able to achieve that. But one of the things that they’re doing is, obviously, allow developments like Sugar Wharf to happen. Just to give some bearings as to where this is we talked about One Yonge at the base of the industry. 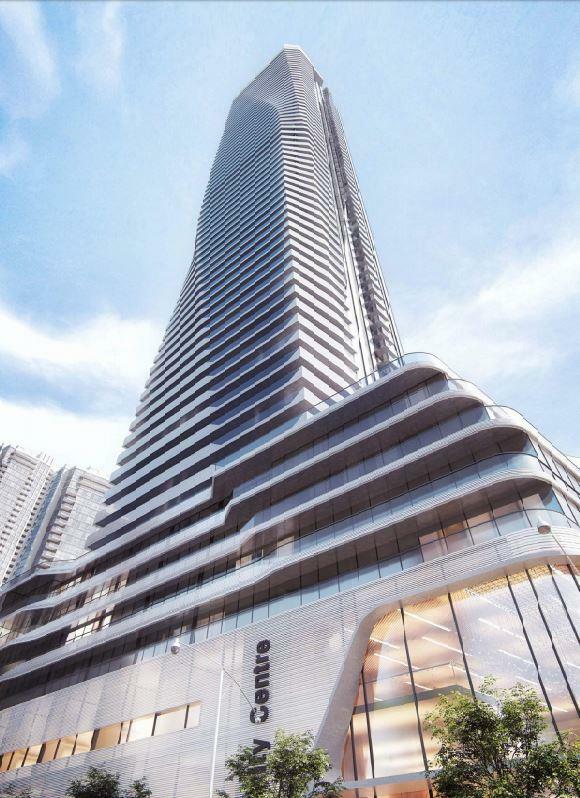 This development is literally east of One Yonge, right? It’s going to be multifaceted. You’re looking at five towers. Roy Bhandari: Because this used to be on the LCBO line. Amit Bhandari: Exactly. So that’s going to … so the bottom right corner. The top right is the first phase, so Sugar Wharf phase one, first phase, it’s in two phases. So phase one would be two towers. The first two towers are 64 storeys and 70 storeys, so not small. Mike Santos: Well, it’s representing 65, 85 of 95. Amit Bhandari: Yes, 65, 80 and 95. Mike Santos: 65, 80, 95. Amit Bhandari: I mean, there’s a lot of entity coming and it’s something that the city wants. I need to emphasize that this is not by accident, it’s by design. The city wants this because another thing that John Tory mentioned was, was a lot of them at Front Street, they did an analysis on this. 40% of the population is walking to work. So a lot of times you hear about this whole concept of why is there so many condos come in? Because it’s going to increase traffic. It’s actually doing the opposite because it’s bringing people back into the city closer to jobs. Mike Santos: They’re having a PATH connection. Roy Bhandari: Well, they just finished One York, right? That’s part of the Harbour Plaza development. So, that’s the most recent but they’ve built so many [inaudible 00:25:14]. Amit Bhandari: I apologize, but it’s a very, very exciting development. Mike Santos: One of the most exciting developments. Amit Bhandari: Yeah, out of a lot of them. A new public elementary school and then, of course, what you mentioned before, the PATH connection. I think this … the path connection well and truly … how can you get any better than that, right? With everything else is going on, it’s … and then just to complete it, put the cherry on top. Mike Santos: Yeah. Do we have a timeline at all? Roy Bhandari: Yeah, we don’t have a launch timeline just yet, but we are anticipating this one, this spring, and that’s why we want to keep bringing this one up because it’s … this is a big one that that’s going to have a lot of demand, so. Amit Bhandari: A lot of demand, a lot of scope, multifaceted just like the neighboring development that’s set to bring employment space for up to 4,500 people and it’s really exciting. So, we are definitely watching out for this one, so. 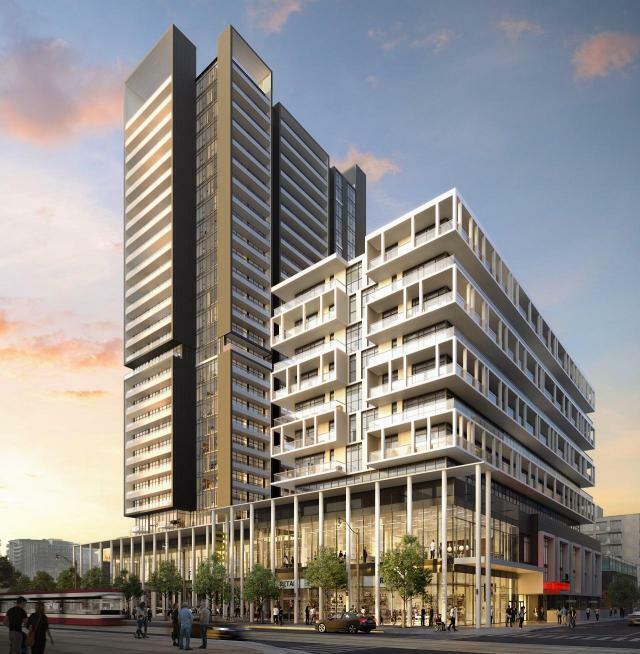 Roy Bhandari: Another one, again, by Menkes is in.DE Condominiums. So, we want to talk about Menkes we know. We do and we can talk about Menkes all day, right? They’re one of the top tier builders, very highly respected. 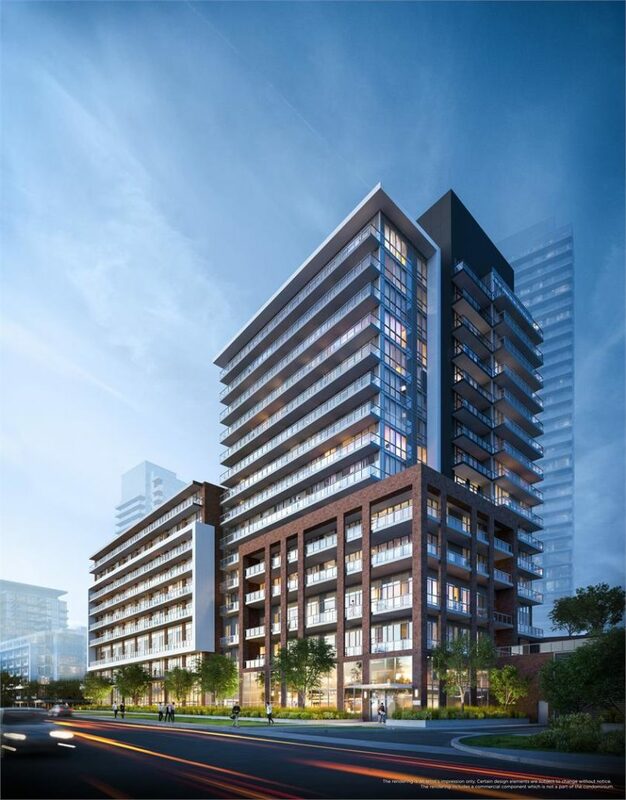 The next one is in.DE Condominiums at [inaudible 00:27:04] Jarvis & Dundas. Amit Bhandari: Jarvis and Dundas. So it’s actually just literally a few steps east. I mentioned this last time as well. Ryerson is my old stomping ground, so it’s an area that’s very close to my heart. Anytime there’s any new development, I get really excited just because the thing is with Ryerson as a whole, Ryerson University, ever since I graduated … it’s always a shame that these developments take place after. It’s always the case, right? Roy Bhandari: The mass shortage. Amit Bhandari: Yeah, and there’s been a lot of development ever since 2011 with PACE [inaudible 00:28:16]. Amit Bhandari: Yeah, and you feel [inaudible 00:28:31] while you touched on this with the Garden District is, is that it’s walking distance to Eaton Center. It’s walking distance to the Dundas Subway Station. It’s walking distance to the Yonge Dundas way which is totally one of the more important public space other than, say, Nathan Phillips Square in all of Toronto, a lot of events in arts, and culture, and stuff takes place there. So you’re walking distance to all these things and, of course, they rise across the street from Ryerson University as well. This one, the nitty-gritty of it, 204 suites, 21 storeys, now, expected completion I think in 2022. Amit Bhandari: Another one we’re really, really excited about. Roy Bhandari: Okay. The next one is another one that we touched on last week, again, called another master plan development it is, Playground Condominiums as part of Garrison Point redevelopment. Mike Santos: Yeah, and this is another one we could spend forever on and when we actually do … we actually do when this is actually launching when I go through a really, really in-depth. Amit Bhandari: I like how he keeps repeating it. Roy Bhandari: Doesn’t give justice to the project. Mike Santos: Yeah. It’s hard to give the scope of it because so much stuff is building in Toronto. This is a massive redevelopment of this areas, so sort of north of Fort York, south of … just south of King West or instead of King West kind of this is the second tower and Cityzen’s redevelopment of Garrison Point. Roy Bhandari: Just pause for one second and just give me a 30-second rundown on what the King Street pilot is. What why is that so important for this area? Mike Santos: So, a certain times of the day, obviously, during more like business hours, basically no cars except for I believe it’s taxis or allowed on the street on King Street. So, in terms of people getting downtown streetcars, it’s going to open it up huge, making a much more pedestrian friendly and, obviously, for people that are in the King West area, Liberty Village area, they’ll be able to get downtown a lot quicker because that was … you could see lineups of street. Mike Santos: I mean, it was all the way through the Toronto, so it’s different in each and every [inaudible 00:31:33]. Roy Bhandari: It takes the cars off the roads of the street cars [inaudible 00:31:37]. Mike Santos: I’m speaking specifically from the aspect of someone who would be looking to purchase at Playground. This is the main reason, right? So investors as well you’re looking at something that’s going to change the number one complaint for people living in that area, right? So, this is a really, really big project with a big, big master plan community again that can go on forever on it but really important to just touch on that aspect for people that are watching because this will be a really big one in second tower. So, yeah, I’m excited about this one when it comes. 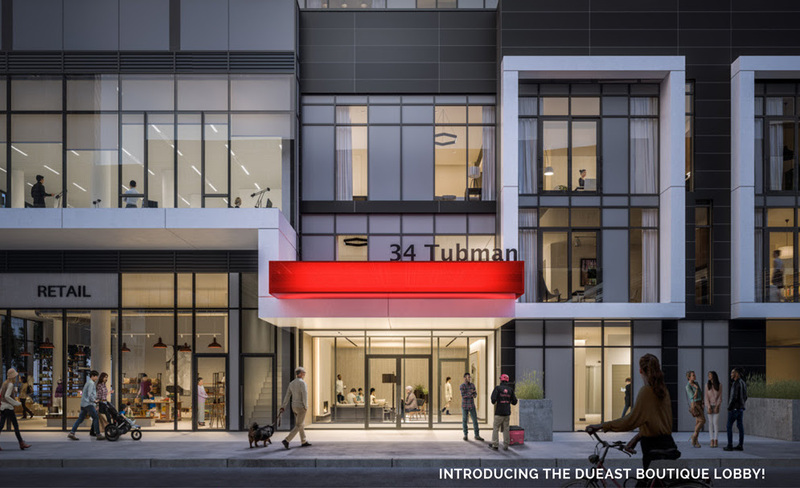 Roy Bhandari: Last but certainly not least is the DuEast Boutique residences which is the next phase of the Regent Park redevelopment by Daniels. Mike Santos: Yes and I actually can’t wait for … when we go into major detail of this one because I love talking about the whole Regent Park innovation. Roy Bhandari: We have and we’ve interviewed Dominic Tompa a couple of times in the past and he’s amazing because he’s seen that title. Amit Bhandari: He’s running through it from, yeah, all through from one day zero. Roy Bhandari: Give us a quick rundown on the boutique. Mike Santos: So it’s a second tower in the development, DuEast sold last fall, sold out super quick. This is phase three of the revitalization of five phases. 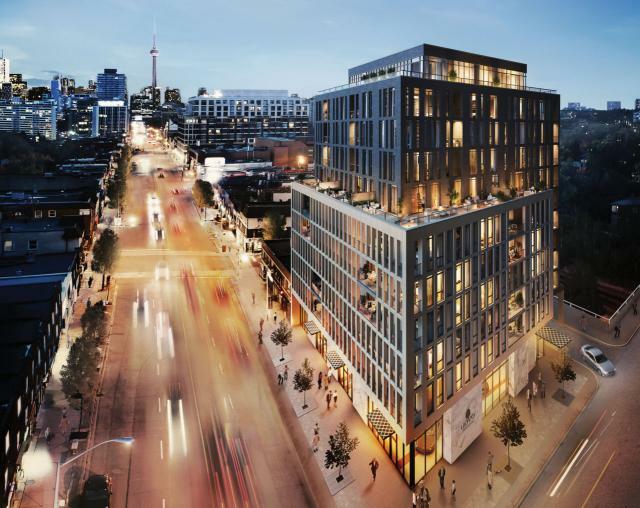 This is going in at Dundas and Sumach right near where the [inaudible 00:32:54] like it’s Daniels last other big tower in that area. So this is Daniels’ building, the ones who have been … I’m sure you know the name. If you don’t, we’ll send out information on Daniels, one of the biggest builders in the city, huge master plan. Mike Santos: GTA. They revitalize areas because they’ve done it in Toronto and Mississauga on household name, for sure. This is a boutique though. It’s only 112 units, so this one’s going to go just as quick. 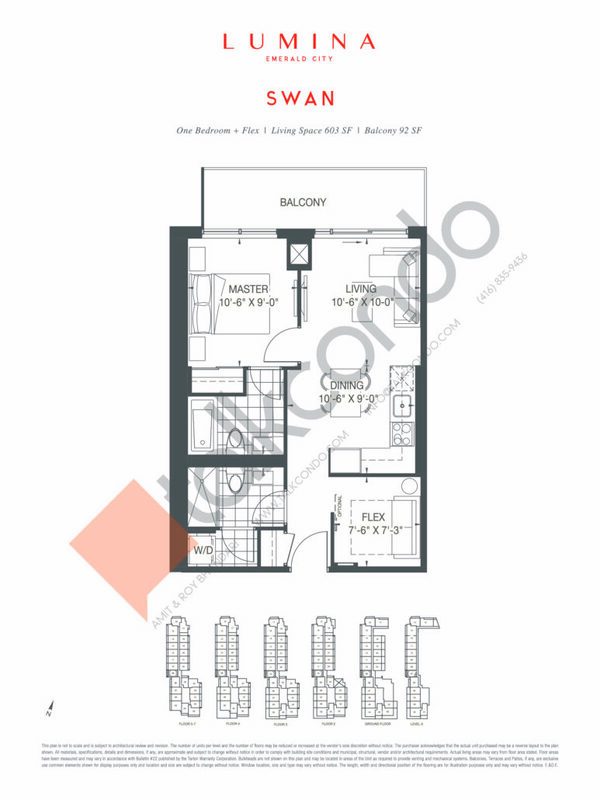 Roy Bhandari: Last week, we mentioned that you could download floor plans. Already, we have a handful of samples. We’ve already been bombarded on this one. So, if you’re interested in DuEast Boutique, two things, let us know soon and, two, for those who are not going to be able to get in because it’s going to be a tough one. This one it’s only a hundred odd units. There is a large tower coming in the fall. We want to make sure that everybody’s aware. Mike Santos: I get a lot of people who are looking at that price point that’s getting a little bit tough in terms of Toronto condos. 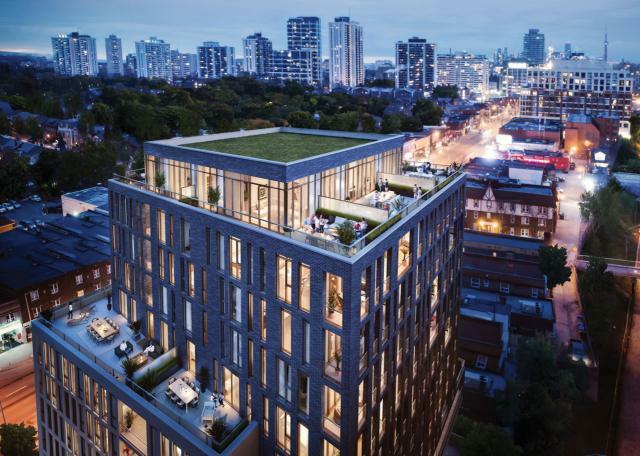 Regent Park, this area, is one they want to definitely look at because this is where … Daniels still has made this super affordable for people especially those first-timers who are looking to get into the market. So, definitely, keep your eyes open for this one. Roy Bhandari: Excellent. That’s everything for this week. We look forward to chatting again next week about all the new condo launches. Roy Bhandari: Thank you very much.